The best parts of the Guns 'n' Roses show at the Nassau Coliseum in Uniondale, L.I., on Monday night weren't musical. Rock shows are about drama, and Axl Rose, the band's charismatic lead singer, knows a thing or two about drama. Where bands on this sort of elevated pop level can coast through the concert ritual, Mr. Rose loves to get angry and rant. Unpredictable and contradictory, his rants have enough aggression to fuel a few more wars; the band was several hours late to its performance, and Mr. Rose was finding scapegoats in just about everybody except himself. Authority everywhere was corrupt and meddling, not letting the people get what they want; this was the politics of resentment, pop music-style. His record company, Geffen Records, rated several outbursts; Mr. Rose said that the band's new album, due out July 23, and its first full-length recording since "Appetite for Destruction" in 1987, was about to be delayed. He urged people not to buy Rolling Stone magazine, even though Guns 'n' Roses was going to be on the cover. Somebody threw something onstage, and Mr. Rose, who had just delivered a soliloquy about how much he loved performing, suggested that the audience beat up anybody who threw things, and threatened to walk off stage if it happened again. Naturally, he took on critics, who -- curses! -- had started giving the band good reviews. It was a masterful performance, provincial demagoguery at its best, fascinating in entertainment, terrifying in politics. Irrationality aside, the group had its musical moments. At its best, Guns 'n' Roses writes gorgeous songs that -- oddly, given its reputation as a heavy-metal band -- tap an American strain pursued by country rock groups in the early and mid-70's. To close the show, for instance, the band did a version of Bob Dylan's "Knockin' on Heaven's Door." And its harder tunes had a genuine intensity; this was hurtling heavy metal that added stories to songs, had distinct melodies and the right amountof volume to keep the genre pure. Moving from fast metal pieces to ballads, the band kept its huge arena sense of scale, and only occasionally did the guitars lose their distortion and their architectural bulk. Mr. Rose has a decent voice in the lower registers; when he moved up toward the falsetto range, he sounded like a small rabbit about to lose a fight with a big dog, and he used that voice to keep an edge of hysteria, passing as emotional commitment, in his pieces. At the end of each song, Mr. Rose would dramatically freeze, as if he'd just gone through something important. That sense of dedication helps makes the band popular: the group exudes a belief in the rock-and-roll experience that, as corny as it is, seems honest. Mr. Rose and the band are still constructing their myth, and the process is as fascinating to watch as anything in rock. Review in New York Times, June 19, 1991. Uhm, same review in those two newspapers I see. Oh well. PUNCTUALITY HAS never been tops on Guns Ν' Roses' list of priorities. The release of their forthcoming album has been switched more often than Zsa Zsa Gabor's birth date, and still nothing is set. Then the lights came up. AC/DC and Zeppelin tapes boomed. Fans fidgeted. To keep the increasingly angry crowd distracted, the crew resorted to focusing a camera on every female audience member they could find, projecting the jiggly results onto the video screen. Finally, at 10:10 p.m. an announcement came that the group was "en route" to the Coliseum “by helicopter" and “should be here shortly." En route from where? Bellevue? Cheeky speculations are germane because GNR has long nurtured an image of romantic self-destruction. Pained tales of drug sprees and cherished sleaze bob to the surface in their songs. One member (drummer Steven Adler) even got the boot last year for alleged excessive drug use. Given this, the tedious buildup to the band's show (unprecedented in this critic's memory of arena rock) harked back to performers like Sly Stone who, in the '60s, was known for showing up hours late or not at all. Such a no-show wasn't ruled out until 10:50 (2 hours and 20 minutes since Skid Row skipped out), when GNR stormed the stage with a one-two punch, including a snarling version of “Mr. Brownstone." Fans may have found the band's late arrival arrogant, but Axl had a neat way of getting them back on his side. By repeatedly blasting the record company, GNR bonded with their largely working-class audience as laborers battling an unfeeling boss. But if such a bond was exploited to excuse the wait, a legitimate and complex connection between GNR and its audience remains. What's most exciting about the band, in fact, is how deeply it has tapped into the frustrations, and exhilarations. of a discouraged white working class in a downward economy. GNR makes it believable through a say-anything public profile and a sound that revives some of the edgier '70s work of Alice Cooper, Iggy Pop and AC/DC. Their best attempts to capture that sound this night yanked the show back from disaster. “Nightrain" tore along with the fury of a rabid dog pack and “Welcome to the Jungle" dove into a Port Authority-sized pool of sleaze with redemptive outrage. The only new number to stand out (from many offered) was a cover (McCartney’s “Live and Let Die”), and the two-hour and 20-minute performance was subject to excess. But if Axl has obvious trouble connecting the dots, at least he has the courage of his creepiness. He and the band are unique in their insistence on airing their most troubled perceptions in public. Far from feigning out-of-control behavior, like most hard rock bands, they make the connection between their powerful, over-the-top music and their lives obvious. For better or worse, they’re one in a million. 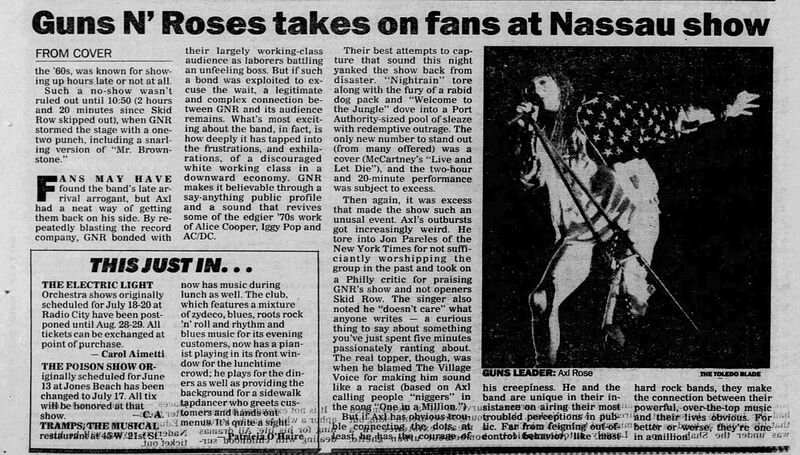 WHEN GUNS Ν’ ROSES KEPT 17,600 fans waiting for two hours and 20 minutes at Monday night's Nassau Coliseum show, the capacity crowd remained relatively calm. Although many fans chanted “Bull—” and booed during the delay, Nassau Coliseum’s General Manager Neil Sulkes says few in the capacity crowd reacted violently. “I’m happy to say there were no serious problems.’’ During the show, GNR singer Axl Rose offered cryptic apologies. “Write to Geffen Records [the band's label],” he suggested to frustrated fans, “and tell them to stop f—ing with my act” Two numbers later, Rose seemed to put the blame for the delay on an over-long photo shoot for an upcoming cover of Rolling Stone. “They [the record company] said only this one guy could do it, and it would just take [a short period of time],” Rose blared. But according to Rolling Stone’s photo editor, Laurie Kratochvil, the shoot in question ended at 6 a.m. Monday. Geffen spokeswoman Bryn Bridenthal concurs, adding that Axl’s remarks, and the delay, are due to “stress, trying to finish the record and tour at the same time. The kid's got a lot on his plate." As to Rose using Rolling Stone as his excuse. 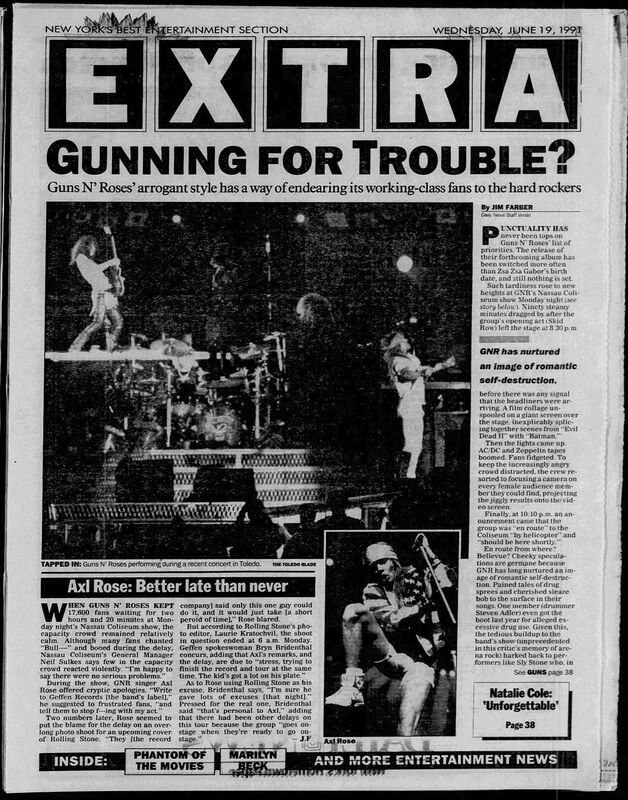 Bridenthal says, “I’m sure he gave lots of excuses [that night].’’ Pressed for the real one, Bridenthal said “that’s personal to Axl," adding that there had been other delays on this tour because the group “goes onstage when they’re ready to go onstage." Axl Rose, the rock guitarist lately best known for stealing model Stephanie Seymour away from Warren Beatty, seems to be a man of many appetites. The other night. Rose showed up at the Old Homestead restaurant with Seymour and a Guns N’ Roses entourage of 20. They rang up a bill of over $3,000 at the Chelsea eatery, consuming almost a dozen 5 1/2-pound lobsters, five Kobe steaks (Japanese beef at a $100 a pop), and eight bottles of champagne. Rose himself polished off both a lobster and a steak. But before he dined, he played with his food. In the restaurant basement, Rose picked out a 10-pound lobster — that’s the kind whose claws can crush a D-battery — and swung it around, demonstrating the aerodynamic similarities between a crustacean and a paper airplane. Then he moved on to another catch: Seymour, whom he nuzzled in a corner of the cellar.